Angel investors are individuals who invest in start-up companies in exchange for equity ownership within that business. As technology has advanced, the flow of angel investors investing in start-up companies has significantly grown. The high profile success of companies like LinkedIn, Facebook, Uber, and many others have attracted angel investor’s dollars who are in search for huge returns. 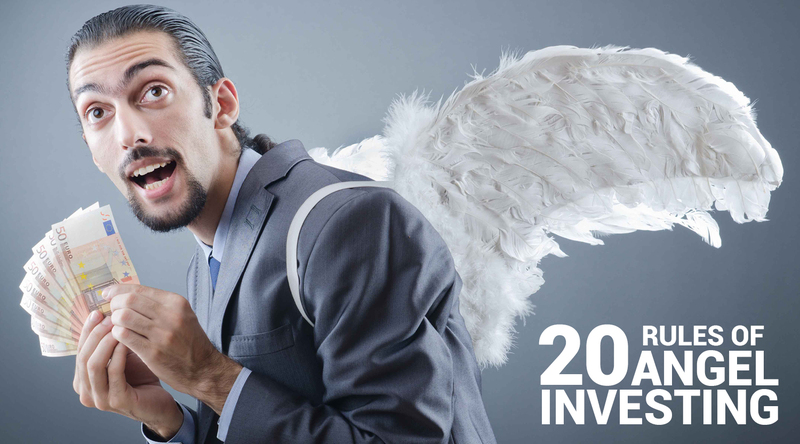 If you are in search of an angel investor for your startup, here are the 20 rules of angel investing that will help your startup stand out as a good candidate for an angel investor’s dollars. What is the typical amount angel investors invest within a company? Angel investors typically invest $25,000 to $100,000 into a company. Depending on the opportunity involved, they are willing to invest more to retain a larger equity percentage. What six criteria are most important to angel investors? Do the founders operate on quality, is their passion behind the company’s products or services, are the founders committed to the long-term vision, and do the founders value integrity. The market opportunity has to be well researched and backed up with facts and the company has to effectively outline their strategy to go big. A well put together business plan, and evidence verifying that the plan is actually producing traction within the marketplace. Disruptive technology that impacts industries or intellectual property that will increase in value overtime. A valuation that is not exaggerated but rather consistent with actual market value. The ability to raise additional rounds of financing if growth does occur. What are the specific qualities angel investors like to see from an entrepreneur? An articulate elevator pitch for their business that demonstrates they know truly know their business. An executive summary outlining the business or a pitch deck that gives a brief but comprehensive illustration of the business. A prototype demonstrating how the proposed product or service works. Early adopters or customers showing that an actual demand for the company exist. What is the average time frame to raise angel financing? It’s important to realize that it will always take longer to raise angel financing than you expect, and it will be a much more difficult process than you had initially thought. Not only are you tasked with having to find the right investors who typically invest in your business sector, but you will have to go through numerous meetings, complete your due diligence, come to agreement on the negotiations of terms, and much more. The act of raising capital can be a very time-consuming and frustrating process. What are the standard financial questions from Angel investors that entrepreneurs should be prepared to answer? What is the amount of capital that you are seeking to raise? How long do you project this initial round of capital to last? What will be your monthly burn rate and how long do you anticipate this rate to persist? Are you able to readily share your detailed financial projections for the next two years? What are the key assumptions that support your financial projections? What key cost components determine the pricing for your product or service? What are the unit economics of your business? Can you accurately predict the likely gross margins? What are the key questions that an entrepreneur should anticipate in regards to marketing and customer acquisition? How does your company conduct its marketing activities or what will be your plan to market your products or services? What is the strategy being used to promote your company to the public? How will your company utilize social media to develop brand followers? What is the cost of acquiring a customer? What is the projected lifetime value of your ideal customer? What are the advertising activities you will be utilizing? What will be the average sales cycle between initial customer contact and closing of a sale? What are the questions an entrepreneur should expect in regards to the management team and its founders? Who are the founders and key team members involved? What experience does the team have that will lead the company to success? What key additions to the team are needed immediately to operate more effectively ? Why is the team in place well suited to execute the company’s business plan? How many employees do you currently have on staff? What are the motivating factors that push the founders to grow the company? What are the plans to scale the team in the next 12 months? What is the level of risk involved for angel investing? There is a great deal of risk involved, and it is a huge gamble. An angel will only invest if he or she is comfortable with potentially losing all of their investment. At best, only one in ten startups are successful. What are the best ways to find an angel investor? The best way to increase your odds of securing an angel investor is through a warm introduction from a colleague or friend of an angel. Using a social media platform like LinkedIn to find powerful connections can also be quite useful. Are angel investors opposed to signing a non-disclosure agreements? Yes. Angel investors are presented with many options of deals to choose from daily. You don’t want to make a challenging process even more difficult by imposing a roadblock to getting an investor interested in your company. You will just have to be careful and not disclose highly confidential information. What are some of the key questions a CEO should ask of potential angel investors? Do you have referrals of other entrepreneurs you have worked with? What methods do you use to help your portfolio companies? What amount of follow-on investment do you think our company will need to succeed? Do you have good relationships with venture capitalists who would fund our next round? What actions will you implement that can be helpful to us in growing the business? How deeply involved are you with your portfolio companies? What other investments do you have that are similar to our company? What are typical terms for convertible note seed financing? Unsecured or secured on the assets of the company – the option chosen is almost always unsecured. The rate of interest and payment options – interest is usually accrued and not paid currently. Discount rate – this is the discount rate that investors enjoy for making an early investment (at a risk) in the company, expressed as a discount from the company’s Series A round of financing. A discount rate of 20 percent is standard. Valuation cap – this is the maximum valuation of the company where the note can be converted in the next round of financing. For example, the valuation cap could be set at $15 million, so that if the next round valuation is set at $20 million, the seed investor only converts at the lower $15 million valuations. This option rewards an early investor for taking the earlier stage risks. Some notes are uncapped, but most early stage investors are strongly against this. What are the key factors in determining the appropriate valuation in a seed round of financing? What is required within an email introduction to an angel investor from an entrepreneur? How did you know how to contact them – was it a warm referral from one their trusted colleagues or friends? Present some short bullet points within the email about what your company does, what problem it’s addressing, and any early traction it’s producing. Provide information that illustrates the founders competence, experience, and passion. Attach a 2- to 3-page executive summary or 15-page PowerPoint deck. How frequently should an entrepreneur give updates to his or her angel investors? What are the main reasons angel investors will reject an investment? The market opportunity or potential size of the business is seen as too small to risk investing within. The founders don’t illustrate their knowledge or passion. The sector that the start-up operates in is not where the investor typical invest. The pitch was made by the entrepreneur through a cold email and not a warm referral from a trusted colleague of the angel investor. The financial projections are vastly exaggerated and the founders couldn’t convince the investor of the justifications that support the projections. The company was based too far away from the angel investor (most angel investors like to invest locally, and in tech-oriented cities like San Francisco or New York). The investor wasn’t convinced of the demand that would exist for your product or service. The investor was not convinced that your company had the ability to differentiate itself from competitors. What legal documents will an angel investor expect to analyze from a company prior to investing? What are the common mistakes made by entrepreneurs during a pitch meeting with angel investors? What are the additional benefits an entrepreneur can receive by taking on an angel investor? What are the best ways for an entrepreneur to prepare for a pitch meeting with an angel investor? Analyze the investor’s LinkedIn profile and website to learn key information. Determine if you have any common connections on LinkedIn and ask those connections for insight or advice. Practice your pitch in front of an audience that will give you critical feedback on what to improve. Review what portfolio companies the investor has invested in. Be prepared to be interrupted and asked questions. Revise and refine your PowerPoint deck. Keep it under 20 slides. Review other company decks for guidance. If you are ready to start your journey, Rikvin experienced team is ready to help you. Tap into Rikvin's network of banks, private equity firms, venture capitalists and angel investors.